The Wesleyan Media Project is an organisation that tracks and analyses all political advertisements in the USA. They’ve produced a fantastic analysis of advertising relating to the US midterms that are taking place in November this year called: Advertising in the U.S. in the 2018 Midterm Elections: Four Takeaways. I’ve taken the liberty of summarising the findings in a few graphics, but the full article is below and is well worth a read. In a few short weeks, voters in the United States will begin casting ballots in midterm elections, deciding the winner in 435 House races, one-third of the Senate seats, 36 gubernatorial contests and thousands of state-wide and local races. As co- directors of the Wesleyan Media Project (WMP), we have been following political advertising in these races closely. Four trends have caught our attention this year. There are as many television ads as ever. In fact, a Wesleyan Media Project (WMP) report found that over 1 million political ads aired on TV in House, Senate and gubernatorial races between January 1, 2017, and June 4, 2018. That is almost double the 550,000 ads that had aired during the same time frame in the 2013-14 midterm elections. One reason for the increased number of ads is that television ad rates have been falling, as there is less competition for airtime from commercial advertisers. Second, some self-funding billionaire candidates running for governor in Illinois and Florida have skewed the numbers upwards. Finally, the political passions inspired by Trump’s victory have led to more candidates running for election in 2018 than in past midterms, sometimes resulting in four, five, six or more candidates competing for their parties’ nominations. The midterm elections are (mostly) about Trump. A report by the WMP found that between June 5 and July 29 of this year, Republican candidates frequently made positive mentions of Donald Trump in televised campaign ads (22 percent of U.S. Senate airings and 35 percent of U.S. House airings). Meanwhile, 38 percent of the television airings by Democratic U.S. House candidates during that same period made a negative mention of Trump. That focus on the president extends to digital advertising. The WMP’s coding of 566 unique Facebook ads created by Senate candidates in competitive races found that 43 percent of Democratic candidate creatives mentioned Trump (none of the mentions were positive), and 29 percent of Republican candidate creatives mentioned Trump (fewer than 1 percent were negative mentions). Clearly, candidates from both parties are nationalizing the race, making Trump a central issue this year. 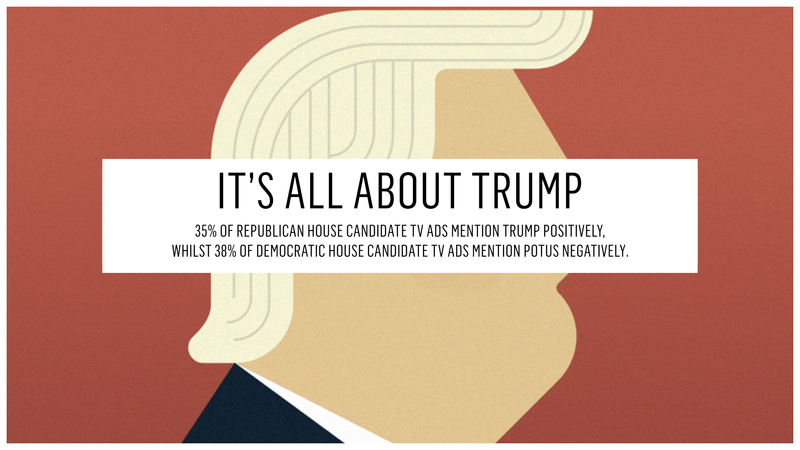 Some candidates, perhaps inspired by the lead of Donald Trump in 2016, have invested heavily in digital advertising. According to Pathmatics (pathmatics.com), a market intelligence firm, Democratic Senate candidate Beto O’Rourke from Texas has spent $3.5 million this year (to date) on digital advertising (including Facebook and most formats of online advertising), while investing $2.2 million on TV ads (as of this writing). His opponent, Republican Ted Cruz, has spent about $300,000 on digital advertising year to date, while spending only an estimated $66,000 on television advertising, according to data from Kantar/CMAG. Surely television ad spending will ramp up as Election Day approaches, but some candidates are choosing to make big bets on digital this year. A number of candidates are hinting at national aspirations through their online ad buys. By examining Pathmatics’ sample of Facebook ads, we can get a sense of which potential contenders for the presidency in 2020 are focusing their advertising on their home states and which are focusing nationally. Senator Kamala Harris, who is not up for reelection in 2018, has spent an estimated $700,000 on Facebook this year, only 28 percent of which were seen in her home state of California. Senator Kirsten Gillbrand has spent $1.5 million on Facebook ads this year, but only 9 percent of that amount was spent in her home state of New York, while 14 percent was spent in California— a state with a large number of Democratic donors. Sen. Bernie Sanders is also spending on Facebook ads nationwide. One-percent of his $550,000 was spent in his home-state of Vermont, where he is up for re-election, while 18 percent was spent in California. Other candidates are tipping their hand that they may not be running for president in 2020. Fifty-four percent of Ohio Senator Sherrod Brown’s $130,000 in Facebook spending, for instance, has been in his home state of Ohio, where he faces re-election in 2018. Senator Amy Klobuchar of Minnesota also appears to be focusing on re-election, with 82 percent of her $220,000 in Facebook spending in her home state (and another 7 percent in neighbouring Wisconsin).